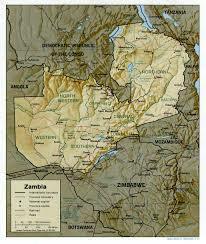 For a recent school project, the children of some family friends asked for information about Zambia. Here was Ted's reply. :) If you have any kids, you may want to share this blog post with them. "I'm so glad to hear that you're doing a project on Zambia. It's a great country--the people are very friendly, there are a lot of Christians, and it has a perfect climate, in my opinion. Many years ago, the traditional dress was animal skins. One elderly missionary lady that we know says that when she was a young girl, a lot of people in her village used to wear animal skins. These days, many Zambian women wear a traditional wrap-around skirt, which in our language of Bemba is called a "chitenge". Above their waist they usually just wear a Western shirt or blouse. Some women also wear a type of African skirt and matching blouse which has puffed sleeves. Sometimes men also wear a shirt that looks similar to this one, but with Western trousers. The cloth for the chitenges and other African clothes is often imported from India. I'm afraid I do not know very much about plants in Zambia. The trees that you see in this picture are quite typical of Zambia--not really tall, not very straight, but wild-looking. 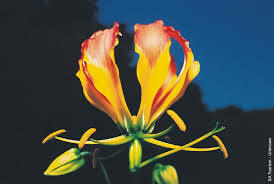 Also, the flame lily is a fairly rare plant, because you cannot grow it in your garden--it only grows wild, so you have to go and look for it in the bush. The number of animals in Zambia has decreased hugely in the last several decades. When my dad was a boy in the village, he used to have to sleep with his head between two pillows to block out the sound of lions roaring outside. But now there have not been any lions in our province (the Luapula Province) for decades. Very few other wild animals remain either--except in our game parks, which still contain a lot of wild animals, fortunately. I have also visited Lake Mweru to the North, which supports a huge number of private fishermen who fish in dugout canoes or boats. They mostly fish at night, using lights to attract the fish to their nets. That's about all the information that I can give you off the top of my head.